Sri Lanka and Responsibility to Protect Arise in UN, Would Ban Take to Council? UNITED NATIONS, May 8 -- With bombs dropping on civilians in Northern Sri Lanka and UN Secretary General Ban Ki-moon still mulling the government's invitation to visit, the talk at the UN has turned to the Responsibility to Protect. On May 6 at a reception attended by Ban Ki-moon and Ed Luck, his special adviser on R2P, as it known, Inner City Press asked Luck how the concept would apply to Sri Lanka. "To both sides," Luck answered. He noted that R2P was formally cited during Kofi Annan's mediation in Kenya. Inner City Press asked what he thought of the appointment of former Indian Ambassador Nirupam Sen as the adviser to the President of the General Assembly on R2P. While diplomatically praising Sen, Luck remarked that India was the "last country to come aboard" on the R2P Outcome Document in 2005. In May 7, Inner City Press asked Nirupam Sen for his views on R2P, specifically regarding Sri Lanka. While refusing to answer on Sri Lanka, Sen insisted first the India wasn't the last to join consensus in 2005, then that it had only held out to make the points of "U.S. civil society groups." 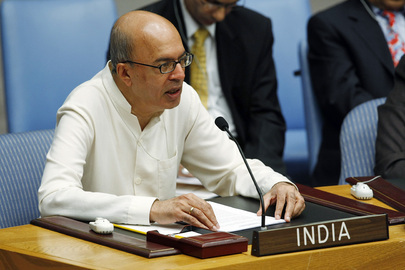 Sen said that India's position had been that R2P should only be a UN doctrine if the use of the Security Council veto by five countries were repealed, to "eliminate the strategic imperatives of any great power." Video here, from Minute 41:42. Ironically, it is China's and to some degree Russia's veto threats which have kept the carnage in Sri Lanka off of the Council's formal agenda, and keep the Council "dialogues" on the topic confined to the basement. Inner City Press asked asked Sen about Sri Lanka's application to the International Monetary Fund for a $1.9 billion loan, and whether the bloodshed and internment camps in the North should be considered. Sen said that "anything the IMF does to reduce and tone down conditionality is a step in the right direction," toward "mitigating humanitarian impact." But what if the loan is used to involuntarily relocate and detain people? The IMF wouldn't do that, Sen implied. But wouldn't they? On May 8, Inner City Press asked a senior Ban adviser about Sri Lanka's invitation. I don't think the Secretary General should go, the adviser replied. The government could just use it. He suggested that, instead, Ban should invoke Article 99 of the UN Charter and push to put Sri Lanka on the Council's agenda, in the name of R2P. The draft outcome document gives the Secretary General that role, Ban's adviser said. Inner City Press asked Ban's Deputy Spokesperson about this an hour later, but she said she had nothing to add to what Ban had said on May 5. Ban's Deputy Spokesperson announced on Friday an upcoming trip by Ban, not to Sri Lanka but Manama, Bahrain. To many these seem to be strange priorities. Inner City Press asked French Ambassador Jean-Maurice Ripert if his foreign minister Bernard Kouchner, another major player in R2P, is requesting a Security Council session on May 11, when he and his UK counter-part David Miliband will be in New York. Ripert said, "On the side of the meeting on the Middle East... we are organizing with UK a meeting... we are working on the exact form." Video here, from Minute 10:53. Footnote 2: In what could be called an R2P cat fight, Nirupan Sen's criticism of Ban's adviser Ed Luck went further, when Sen said the Fifth (Budget) Committee was right to refuse to confirm him in his post, and to keep him on "a dollar a year." Inner City Press asked Luck about the dollar, and if he has a UN phone number. Of the latter, Luck said he still doesn't, but that at the UN there are many people with phones but the Secretary General doesn't pick up at the other end. And if the call came from the Vanni conflict zone, would Mr. Ban pick up?